At New Life it is our desire to provide excellent ministries geared towards kids. No matter what the age of your child we want to provide a safe environment for your child to learn about God in a fun and interactive way. We have several kid’s programs developed with your child in mind. As your child matures we want to provide a program that will meet their every changing need. Listed below are the different programs where your child can get involved in Blaze New Life Kidz Ministry. 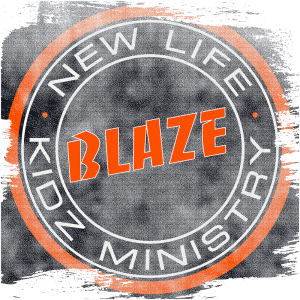 If you have questions about Blaze New Life Kidz Ministry or if you’re interested in becoming a volunteer, please contact the church office. XP3 Blaze is for 5th-6th grade boys and girls. We meet on the 2nd and 4th Wednesday of the month. XP3 is designed to give students a lasting understanding of 3 things….they are created to pursue a relationship with their Creator, they belong to Jesus and are defined by what He says, and they exist to demonstrate God’s love to a broken world. XP3 will also meet on Sunday mornings at 9:45am two times a month for a small group discussion. This group will include 5-8th grade. Please check church calendar for times and dates.